AFRICANGLOBE – What matters more: the size of the pie or how many mouths it has to feed? It depends whether you’re eating pies, or selling them. Most of Nigeria’s 170 million people live below the poverty line, so many complained they didn’t feel any richer when the oil producing nation’s statistics bureau announced on Sunday the economy had replaced South Africa as the continent’s biggest. Nigeria’s 2013 GDP was rebased up to an estimated nearly $510 billion – a “pie” one and half times the size of South Africa’s, but feeding more than three times as many people. Nigerian leaders hope the statistical revamp will help them “sell” Africa’s most populous market to investors, including mall-builders, manufacturers and retailers offering everything from processed foods and household appliances to luxury cars. In GDP per capita terms, Nigeria is looking healthier than before rebasing: per capita GDP was $2,688 last year, from an estimated $1,437 in 2012. Yet that masks growing inequality: at around 60 percent, absolute poverty in Nigeria is stubbornly high despite five years of average 7 percent annual GDP growth. But are better living standards for all really what matters to investors looking to cash in on a big economy? On a per capita basis, Botswana, Mauritius and Seychelles are among Africa’s top five richest states. None has a population of more than 2 million, so they are admired but cannot claim heavyweight status when it comes to competing with other African countries for the attention of foreign investors. Nigeria’s potential is predicated on its large population. Economist Jim O’Neill notably included it in his MINT group of countries, alongside Mexico, Indonesia and Turkey, which he thinks will join the BRICS (Brazil, India, Russia, China and South Africa) he named as the emerging economies shaping the world’s future. All have large, swelling populations, with a demographic bulge around the soon-to-be-most-productive younger generations. For businesses deciding where to invest next, a consumer market of 170 million beats the Seychelles’ 85,000. For retailers targeting customers at the bottom of the socioeconomic pyramid, a national income spread around more households – lower GDP per capita, in other words – might actually be a good thing, many economists argue. If you are selling washing powder or fizzy drinks, better a large number of consumers on modest incomes than a small number of wealthy. There is only so much cola most people can drink. For Kenyan industrialist Manu Chandaria, chairman of Comcraft Group, which sells ironware, including corrugated roofs and pots and pans, Nigeria has massive potential. Comcraft is in 18 locations there, despite the fact that its Nigeria manager has been kidnapped three times by criminal gangs – a common risk facing businesses in southern Nigeria. 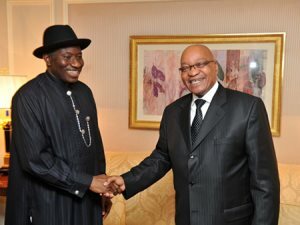 “Nigeria is just colossal,” he told the Africa Summit in Nairobi. “Everybody needs to eat. Everybody needs shelter … Anybody that brings in money needs a pot to cook in, they need a roof – so we are in the right place.”. “Until the country invests more in infrastructure, invests more on other activities outside of oil, until that starts to develop the economy … I think the potential is not like it is in South Africa,” said Mark Turner, Africa Director for Massmart Holdings, a unit of U.S. retailer Wal-Mart. Massmart currently has two stores in Nigeria, with another opening in the coming weeks – compared with 300 in South Africa. Turner said he could see the company opening as many as 15 stores in Nigeria, if the country could deepen development. Yet the market attraction of Nigeria’s growing middle class is already there – Shoprite just opened a store in Kano, despite the threat of an insurgency in the north, and a Massmart ‘Game’ store will soon join it there. But Nigeria’s growing inequalities add to “political risks, as a result of perceived marginalization,” said Razia Khan, chief Africa economist at Standard Chartered Bank. Unless something is done to lift the impoverished masses, the risk of social unrest, already being reaped in a bloody insurgency in the destitute northeast and oil theft in the south, will grow. Next articleCan Single Mothers Turn Boys Into Men?